When my husband and I found out we were having a little boy, after having two girls, we were VERY excited. I immediately started thinking of nursery ideas and scanning Pinterest for color ideas and all sorts of do-it-yourself projects. Having a brief history and obsession with sewing, I quickly decided I would make the crib bedding myself... it couldn't be that hard could it? The ONLY thing I did not make is the fitted sheet. I know I'm capable of it... I just didn't want to do it, lol. 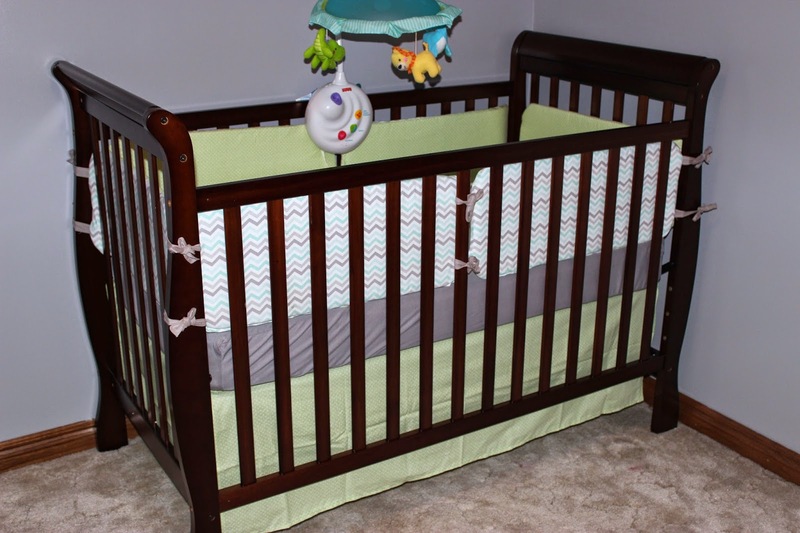 I found an $8.99 grey jersey knit crib sheet from American Baby on Amazon.com and decided it was perfect for my crib set (plus i love the jersey knit crib sheets!) Cheaper and easier for me to buy this than to make it myself. I actually made two, and I didn't use a tutorial for this that was found on the internet anywhere. I simply knew what I wanted to accomplish: a rectangular blanket with cotton fabric on both sides so it's lightweight for Spring/Summer (I also made one with minky on the back for colder weather). Its the most basic of basic projects. I added detailed instructions below for Minky blanket the way I did it (I'm no expert but it will help a beginner sewer achieve this). Here's what you'll need: Two square or rectangular pieces of fabric in sizes and styles of your choice, coordinating thread, sewing machine, pins. Pre-wash fabrics to ensure they won't shrink after sewing. Place your two pieces of fabric facing each other (the "front" sides together). Pin generously, especially if using minky, and stitch around nearly the entire length of the blanket, leaving a gap large enough to allow you to turn the blanket right-side-out when done. Remove pins and turn blanket right side out. 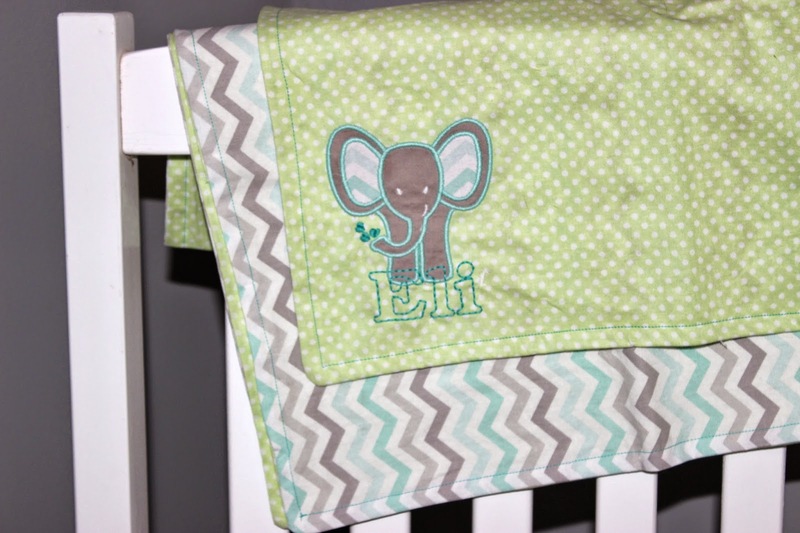 Sew a finishing stitch anywhere from ½ inch to 1 inch away from edge of blanket. Fabric I used: JoAnn Fabrics Nursery Cotton in "White Dot on Green" and JoAnn Fabrics Nursery Cotton in "Butterfly Chevron". 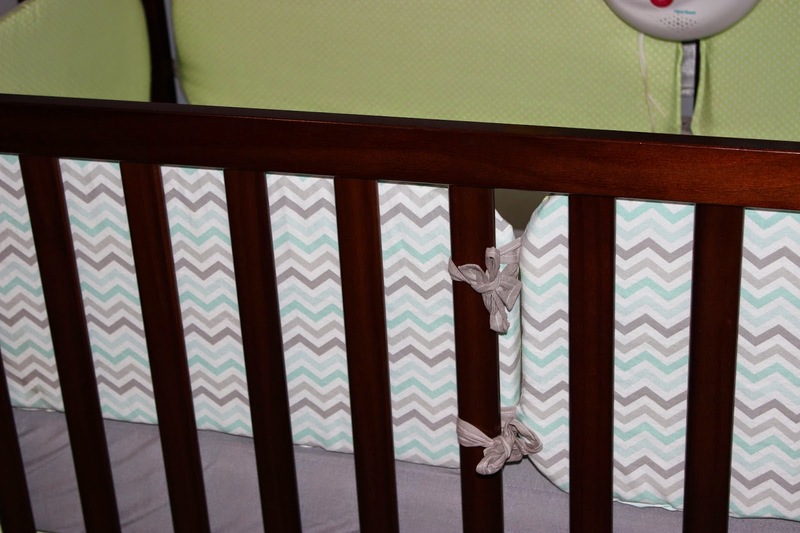 With ribbon accents in JoAnn Fabrics Fabric Quarters in "Grey Solid"
My particular crib skirt was made by following a simple chart I found on Pinterest (you can see it here) from Project Nursery. 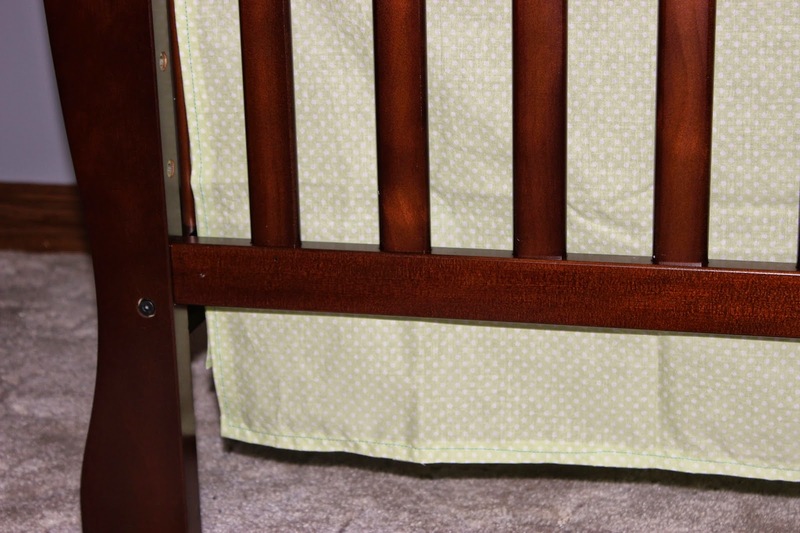 Its simple and very effective for a basic straight edge, flat crib skirt that attaches to your mattress frame using sticky velcro pads. EASY!!! For girls cribs I think the ruffled skirts are much cuter, but since we're having a boy I decided for the flat skirt look instead. Fabric I used: JoAnn Fabrics Nursery Cotton in "White Dot on Green"
That's it! Those are the resources I used for my DIY Crib Bedding. It took me approximately 3 days to finish this (working on and off for a couple hours at a time). If you're someone who has the time to sit down for several hours and work, you could totally finish this in one day!